‘Eenadu’, with over 10 million daily readers in Andhra Pradesh, the state of India in which Sathya Sai Baba lives, has reported of a speech problem he faces. “Lacking in Clarity: There was a lack of clarity in Sathya Sai’s speech because of his old age. The interpreter struggled much to translate his speech into English. Satya Sai was seated in a special wheel chair which was brought very close to the car, so he could very slowly get into it. At the time of the speech, he stood up with great difficulty with the help of his assistants.” (See reproduction of ‘Eenadu’ newspaper page, below). “The attributes of the Avatars are beyond human comprehension…. Rama and Krishna were ever youthful. Have you ever seen a picture of Rama or Krishna with grey hair?….. Usually old people have wrinkles on their faces … I do not have any signs of old age. (loud applause). There is not a single wrinkle on My face”. Sanathana Sarathi, October, 2002. Examination of many photos of this octogenarian may prompt the notion that hair dye is used on his hair. 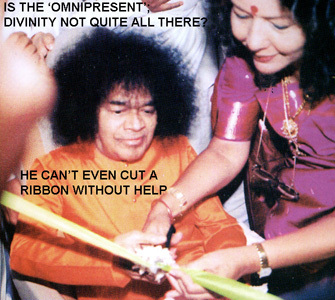 See videos which reveal Sathya Sai Baba as unable to cut his birthday cakes any longer. Sathya Sai Baba Tells Untruths About His Health? Sathya Sai Baba’s Hip Joint Injury and Surgery – 2003. What are the actual facts of the matter? 2006 – Puttparthi Village Without Water? Sai Baba Sits and Cries? This entry was posted on August 2, 2009 at 8:26 pm	and is filed under Miracles, New Age, Opinion, Rationalism, Religion, Skeptics, South Asia, Spirituality, Uncategorized, World Religions. Tagged: Ageing, ageism, Eenadu, Gaffes, Godmen, Old Age, Senility. You can follow any responses to this entry through the RSS 2.0 feed. You can leave a response, or trackback from your own site.